Search "Alberta" 1 result has been found. 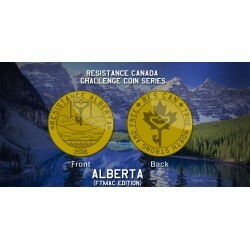 The first in the Resistance Canada coin set, this special edition brass plated coin features Alberta's provincial shield showing the various landscapes of the area. A portion of the proceeds of this coin will be donated to the Canadian Red Cross' Alberta Emergency Fire Appeal.